Take a quiz to test your identification skills! Have you tried out the iSpot identification quizzes? These make use of the observations on iSpot to provide a fun activity that helps you test your skills and practice identifying different wildlife groups. See our Quiz Help page for further details on how to set up your quiz. If you have any questions that aren't covered on the Help page, or if you notice any problems when using the quiz, please add your comments to the quiz thread in our site feedback forums (or use the iSpot contact us form). 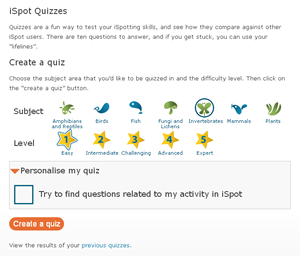 The iSpot quizzes have been developed as part of The OpenScience Laboratory, an initiative of The Open University and The Wolfson Foundation (more information).